Signature Kitchen & Bath has been serving the St. Louis metro area with beautiful bathroom and kitchen remodels for over 40 years. We are honored that over 60,000 St. Louis homeowners have invited us into their homes and have trusted us to complete their bath and kitchen remodeling needs. Our mission is to make sure your kitchen or bathroom remodel is not only more beautiful and functional, but more valuable in the end. 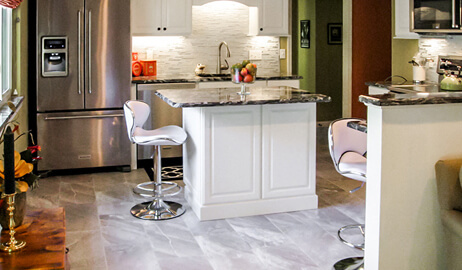 When you choose Signature Kitchen & Bath for your project, you will be choosing an experienced staff that is honest, friendly, and up-to-date with design trends & products that fit St. Louis. 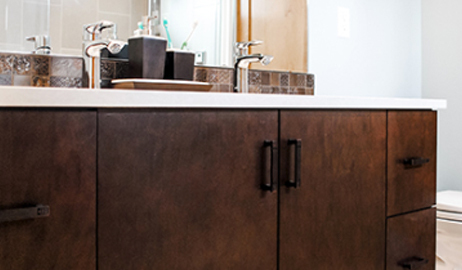 View our kitchen and bathroom remodeling galleries to experience the work we have done for other satisfied homeowners, and when you’re ready to start your remodel, give us a call! Does your Kitchen make a statement? We work with the most reputable brands in order to offer you high-quality products at competitive prices. View our Kitchen Gallery and let your dream become a reality! We take pride in our quality of work and partner with top of the line brands so we can provide you with the best options and finishes. View our Bathroom Gallery – we are sure you will be inspired! One thing that makes Signature Kitchen & Bath stand out from the rest of the competition is the amount of prep work our designers do before the project starts. Other companies charge design fees for their customers to meet with the designers, but not at Signature Kitchen & Bath. Meeting with our kitchen & bath designers is absolutely FREE! So whether you are looking for a kitchen design or bathroom remodel, you can rest assure that our team is there for you to find exactly what you're looking for. When you provide us with your measurements or floorplan we schedule a "discovery meeting" to discuss all the design elements you would like to see go into your project. After we've completed our first design draft, usually between 1 and 2 weeks, we'll set an appointment for a design consultation. We will then meet at your residence to check the measurements and confirm that everything fits just right. If Signature is installing the project, this meeting will include our installation team as well. Once design elements are appoved and we've made sure that the construction alterations have been properly planned, we can move on to the ordering stage and begin to make your dream a reality. Linda has worked on many kitchens, including this one in Ballwin, Missouri. This look features Granite countertops, chandelier lighting and Merrilat cabinets. Take a look at the full remodel and let Linda remodel your kitchen! This gorgeous kitchen remodel by Debbie in Chesterfield, Missouri includes white Shaker Cabinets, a stainless-steel sink and glass tile backlash. View the full remodel and get the kitchen of your dreams today! This St. Louis bathroom remodeled by Dina features a frameless shower with custom tile work, a freestanding tub and light gray shaker cabinets with a glossy finish. See the full remodel for yourself and begin your next home renovation today! Heather used her design expertise to remodel this kitchen in Manchester, Missouri. The brand-new kitchen includes Dura Supreme cabinets, a subway tile backsplash, and a built-in wine cooler. Check out the full remodel and let us help you with your next renovation! This newly renovated kitchen in Clayton, Missouri features beautiful Cambria countertops, with a glass mosaic tile backsplash and Northern Contour Cabinets. Get inspired today by viewing the full remodel!